Created by designer Richard Riley from Tom Spina Designs, this striking piece of furniture looks like it is truly from another world. 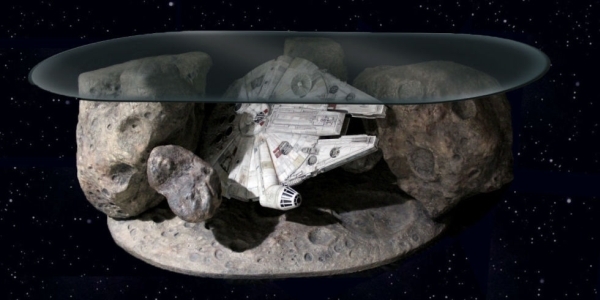 The coffee table literally recreates the thrilling asteroid chase scene from ‘Star Wars: Empire Strikes Back.’ As the name implies, the gorgeous coffee table appears like some asteroids planet, where TIR Fighter is flying nearby Millennium Falcon in pursuit. Tom Spina Designs has cleverly modified and custom-painted both Millennium Falcon and TIE Fighter models made by Hasbro. These hand-painted characters from the sci-fi movie seem too realistic and ready to pop out of your coffee table any minute. 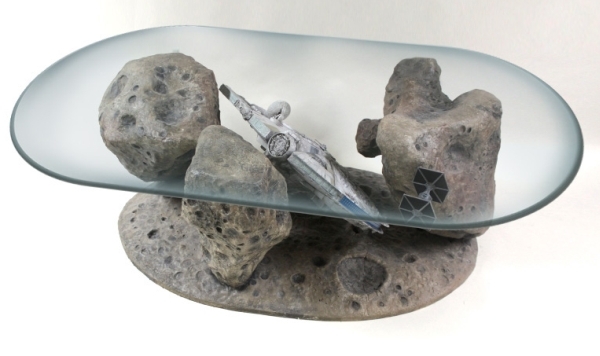 A huge oval-shaped glasstop rests on top of these grayish asteroids, giving a touch of transparency to the coffee table. The see-through glass allows you to have glimpse of action-packed starfighters in middle of asteroids. You’d never want to hide this spectacular coffee table even with your cup of coffee or while playing your favorite game. 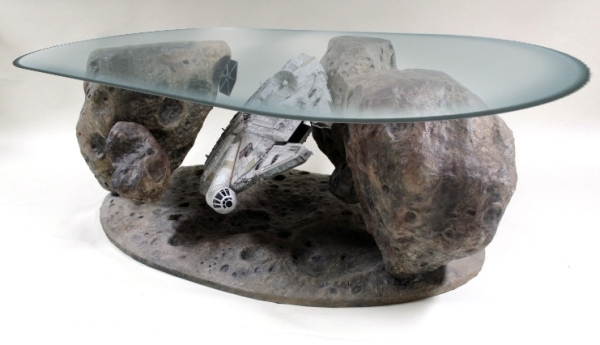 This is truly dream furniture of any Star Wars’ fan. But sadly, this one belongs to a filthy rich client, who commissioned Tom Spina Designs to create custom-made Millennium Falcon Coffee Table. So, only one exists so far. However, if a creative artisan hides within you, then you can try making the same for your living room.